Parents & Staff - Iowa Core - What is Iowa Core? Penny Wars May 6-10th Put your spare change towards a great cause! All proceeds will go towards Meals For The Heartland. Here's how it works: * Each penny counts as negative points for OTHER classrooms. So dropping five pennies in another classroom container gives them -5 points. * Any other coin or bill counts as positive points for YOUR class. * Containers for K-4 will be . . .
Cross Country will be hosting a co-ed running camp for students entering 3rd-8th grades. The camp will be held from Monday, June 24th to Friday, June 28th with the fun run on Saturday, June 29th. The cost of the camp is $10 which goes towards a camp t-shirt, ribbon for the fun run, and other awards. 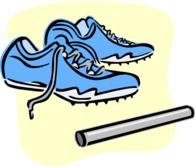 * Students entering grades 3-5 will be meeting from 8:00-9:30 during the week, with their mile run on Saturday at 8:00. . . .